Back on the water, I've moved away from the tailwater trout and onto small stream panfish and bass. The smallies are really active now as well as all manner of sunfish. I've been on multiple Cumberland Plateau bluelines lately both here around Crossville and down towards Chattooga. 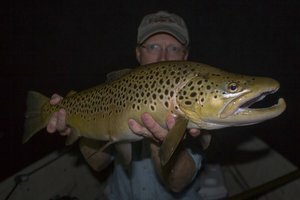 The next three months will provide some of the best fishing these streams have to offer. As far as gear, I normally fish a fast-action 9' 4wt rod. 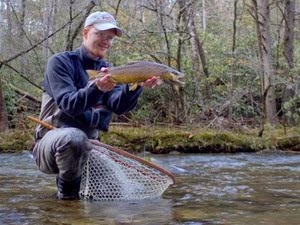 Two weeks ago I fished a St. Croix Legend Ultra on the creeks near Chattanooga. This past Friday I was fishing a prototype rod from James Marsh. Both times I had my old, battle-worn Orvis Battenkill reel with a four weight Rio line. The important thing is that you choose a rod capable of throwing anything from little beetles or ants to small clousers and wooly buggers. Any reel and floating line will do for this type of fishing. Generally the fish aren't picky although they can be a bit spooky at times when the water starts to get low. 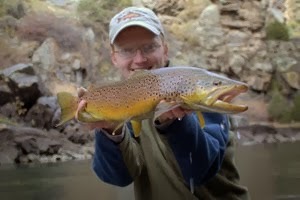 Last Friday, I fished a local creek that is flowing well above seasonal norms due to all the rain we have had lately. The fish was slow at first, mainly because I was unused to fishing with the higher water conditions. Once I tied on the correct fly and figured out where the fish were, it was game on! I probably caught in the neighborhood of 30 fish in a couple of hours give or take although I can never truly keep an accurate count of how many fish I catch. 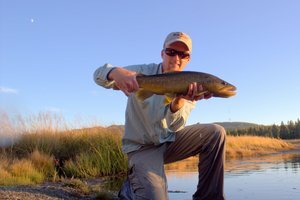 Catching fish is one of those bonuses to any fishing excursion, and I try to keep my definition of success at least somewhat detached from the number of fish caught. Still, its always nice to come back and tell everyone that I caught more fish than I could count or remember. My dad came along just to hang out and take a few pictures of the scenery. It is always nice to have someone around while fishing, at least most of the time. It is hard to juggle the camera and the fish without causing undue stress to the fish although definitely possible. Having someone else along just simplifies the whole process. I hear you about catching as a bonus. Beautiful fish. I love chasing smallies and red eyed rock bass. They are both my two favorite fish. It really doesn't matter the size for them as they are both great fighting fish. I can also appreciate the small stream setting. This is probably my favorite type of water to fish. I can't wait to see how you do for the rest of the season. Nice work and nice post. I'm learning to enjoy these fish more and more every year. It helps that they are so accessible. 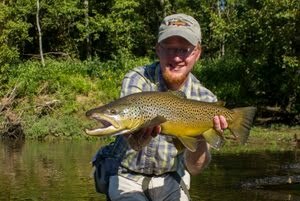 I'll definitely be heading out again soon to catch someo more of these amazing fish! Glad to hear that you are appreciating them more. They really are great fish. I cut my teeth on brookies in small mountain streams but switched to the smallies and red eyed rocks when I learned how they fight and about the top water action. Sounds like a great trip. My father and I did the same just last week. Nice post, I just got into some smallies this last weekend. It was probably my most productive smallie day ever. They were all on the small side too. If you'd like to see pics. Check out my blog.